Your career is like a bus. A big red London bus if you will. You can either be up at the front in the driver’s seat with the responsibility for the controls and direction it takes, or you can be a passenger. Most of the time it’s up to you to drive your own career bus. Why should anyone else be more interested and invested in your own career success, your earnings and your potential than you? They’re not. My new book It’s Always Your Move is designed to give you clear guidance, proof and inspiration with many real-life stories, strategies and steps for you to take to boost your income, options and self-confidence and to guide you to your next move, and the one after that. This book is designed to give you the certainty and clarity to always be ‘at choice’ and to avoid becoming OR staying stuck. Well first of all it’s about boosting your self-confidence and future-proofing your career. It’s about maximising what you already have and know and starting right where you are, now. 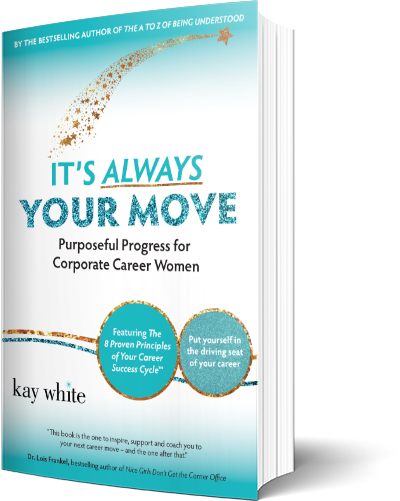 It’s Always Your Move features the 8 Proven Principles of Your Career Success Cycle™ in motion in your career all the time. What Can I Do Now Kay? Receive a Complimentary sample from the book! How to prepare yourself for internal and external interviews, what to say and how to maximise these opportunities to shine. Leave your details here to receive Principle 5 direct to your Inbox.